Today marks the end of my eight week completion of the Hammer and Chisel workout program from Beachbody. I am so glad to have made it through the total program, enjoyed all the workouts and I have seen positive results. The past month the workouts were a little longer as there were more days that you added on the 10 minute Ab Hammer or the 10 minute Ab Chisel workouts after completing the days scheduled workout. Most of the workouts are around 30 to 40 minutes long but if you add on the 10 minutes of abs you are looking at around 40 to 50 minutes for that day. I also had a new workout friend – my other cat (as seen in the photo above) decide to join me for many of the workouts. She is older and kind of shy so she usually is in the other room but I guess she decide she liked Hammer and Chisel. 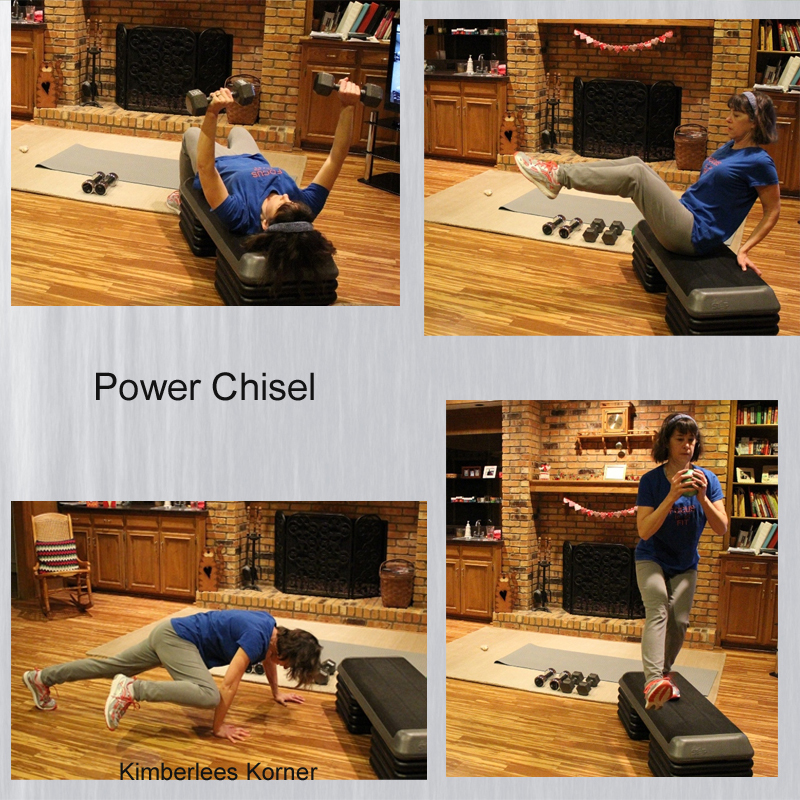 Power Chisel workout is a workout that can be found on the Deluxe dvd set that you have to purchase as an add on to the program. The set includes four bonus workouts on one dvd. You get Hammer Build Up, Power Chisel, 15 minute Leg Hammer and 15 minute Glute Chisel. I like having these additional workouts so that I have a little more variety with the program. 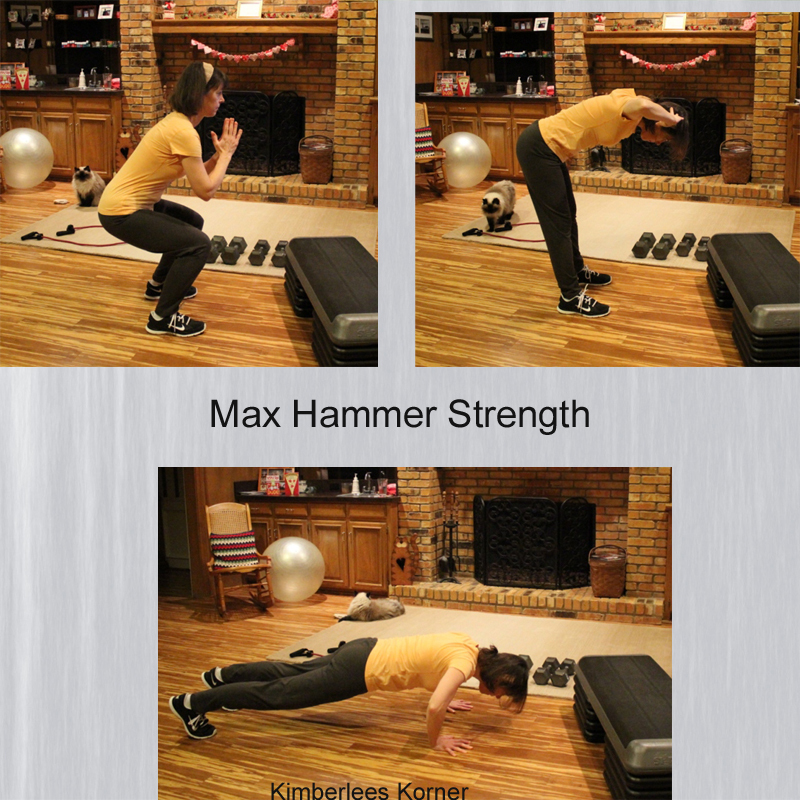 The 15 Minute Leg Hammer workout is a great one for the legs as well as the core. The 15 Minute Leg Hammer and the 15 Minute Glute Hammer are incorporated as add ons to your regular workout for that day so you increase your workout time on those days. My final measurements on the last day of the program show that I have lost inches. I mainly lost inches in my waist, hip and thigh area. My arm measurement actually increase by about a 1/4 to 1/2 and inch – probably from all the weight lifting and increase in my bicep muscle. I lost a half and inch from my waist, one inch from my hips and one inch from my upper thighs. I can also see a lot more definition in my shoulder and back area. My main goal was to tone up and lose inches in the hip and waist area so I feel like that was accomplished in the last couple of months. Overall, I would recommend this program to anyone who is interested in losing some weight, gaining some lean muscle and learning how to control portions with their eating. The program comes with a set of containers to measure your food portions and guidelines for how much you should be eating each day. I will say that using the containers and recording my eating each day for the past two months has been a real eye opener for me on how much and what I am eating. I think that keeping track of my food or a food journal each day has really helped me see better results with this program. I have always been a pretty healthy eater but this program taught me to control how much I was eating. So, now on to the next month and a new workout program and schedule. I have decided to do my new Cathe ICE program, some yoga and maybe a little bike riding if the weather is nice enough for the month of March. What workout are you currently doing? Let me know my leaving a comment. Last week I bought some new Kwik Sew patterns during the Presidents Day sale at Hancock Fabrics. 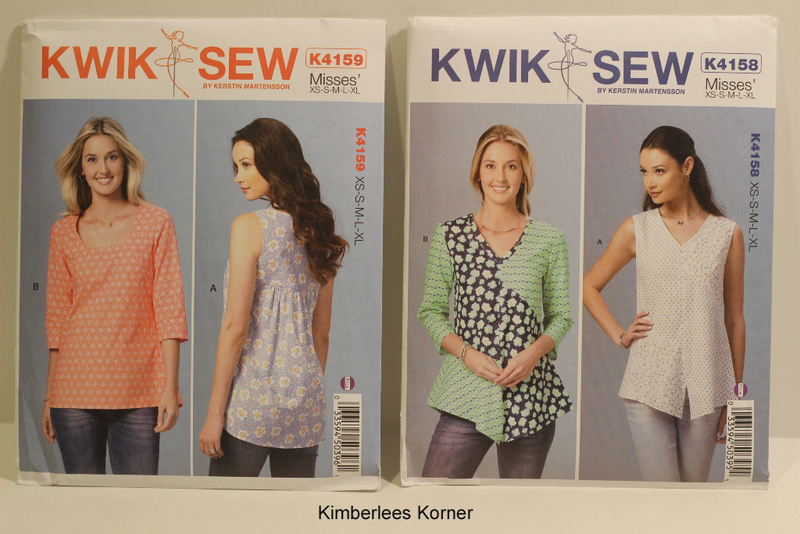 Kwik Sew patterns are one of my favorite pattern companies. The patterns are well designed and they have excellent instructions with them. They also offer a lot of beginning type of sewing patterns for the new seamstress that have easy to follow directions. 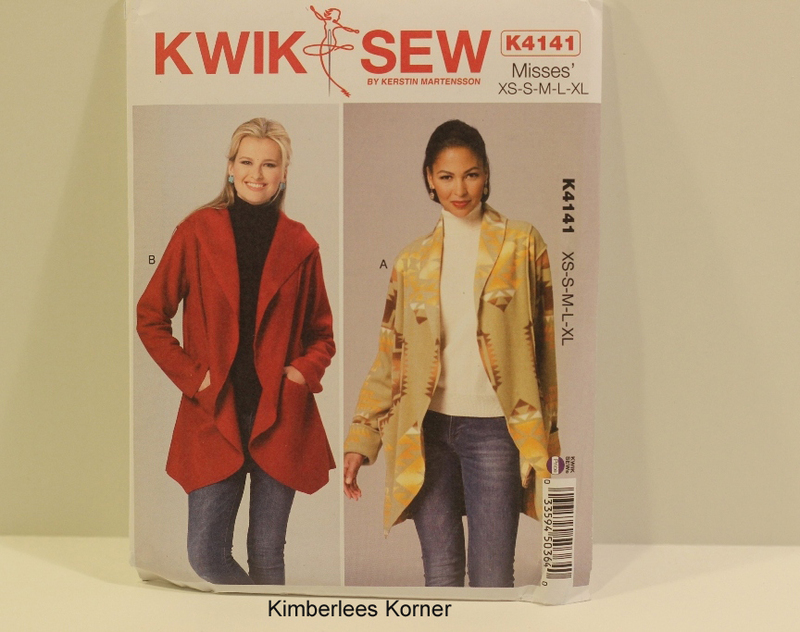 The Kwik Sew patterns are a bit more expensive than other pattern companies which is one of the reasons I buy them on sale when Hancocks has them for $6.99. In my opinion they are worth it though. They come with a slightly heavier pattern paper and you can easily trace it using pattern drafting paper or interfacing so you can use multiple sizes in the one pattern. This is great if you sew for others and need more than one size. I am looking forward to making the tops, as seen in the top photo above, for spring and summer. The jacket pattern in the second photo is something I hope to complete in the next couple of weeks. I found a nice french terry fabric in a beige heather color to use for that pattern. There are two versions of the pattern – one with a hood and one without. I think I am going to make the hooded version. 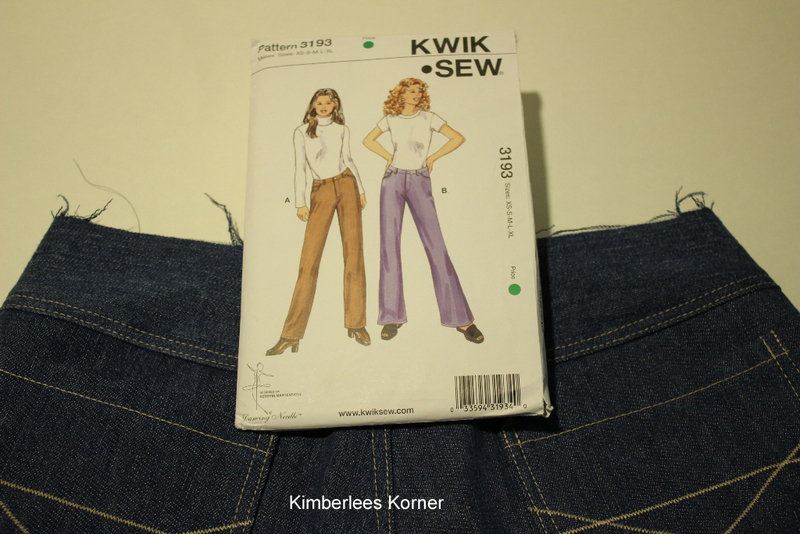 Currently I am finishing sewing another pair of jeans using the Kwik Sew jeans pattern I have had for many years. This is one of the greatest patterns for jeans and I love the fit and the easy to follow directions. I think this is the fifth or sixth pair of jeans I have made in the last five years. I prefer to sew my own jeans that way I can get the fit the way I want them. The process of sewing jeans really isn’t that hard if you do a little here and a little there. I can usually get a pair made in about a week just sewing an hour or two a day on them. I don’t think Kwik Sew sells the jeans pattern anymore in their current line of patterns but you can find sellers on etsy that sell vintage or out of print patterns for reasonable prices. I also recommend the Craftsy class Sewing Designer Jeans with Angela Wolf. I took this class a couple of years ago through Craftsy and loved it. It really teaches you how to make your jeans look professional and lots of tips for getting the fit right. What kinds of projects are you currently working on? Let me know in the comments. 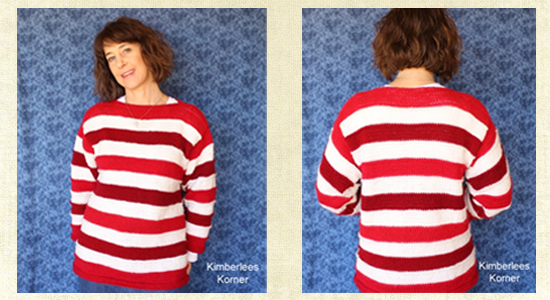 My most recently finished knitting project is a sweater that I designed using various red yarns and a white yarn. 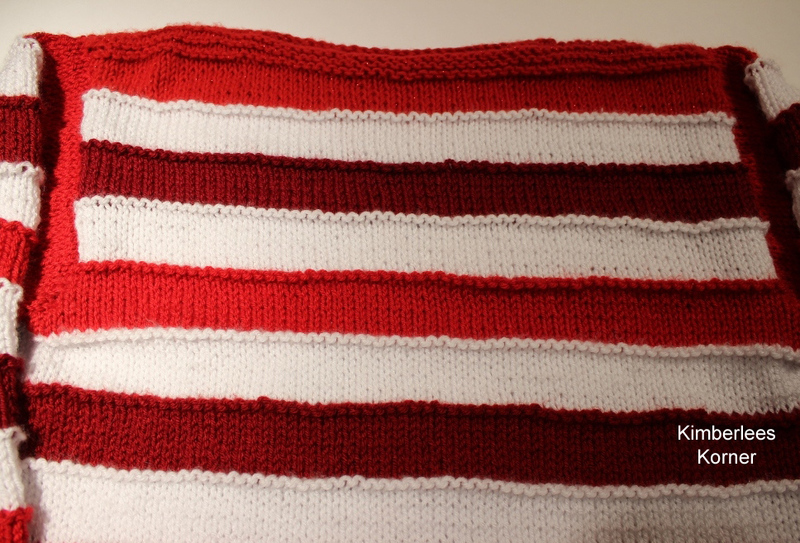 The idea for the sweater began from the knitting stitch a friend of mine was using to knit a baby blanket. I had some various red yarns, a skein of this and that, all in medium weights, and I wanted to combine them and use them up. I decided it would be best to alternate them with some white yarn since some of the yarns were a dark red and other were a true red, or a red with sparkles in the yarn. I am really happy with the way the sweater turned out and the fit. I am also happy that I got it done in time to wear for Valentine’s day. My husband commented that I would be ready for Christmas, too – especially if I added a green accent to it – so I guess it can be worn for a couple of holidays. As I mentioned before the yarns I used were various medium weight yarns. Three of the yarns were the Hobby Lobby I Love This Yarn – which is a great yarn for sweaters, in my opinion. It knits well and there are tons of colors. The other two yarns were Red Heart that I had left over from other projects. 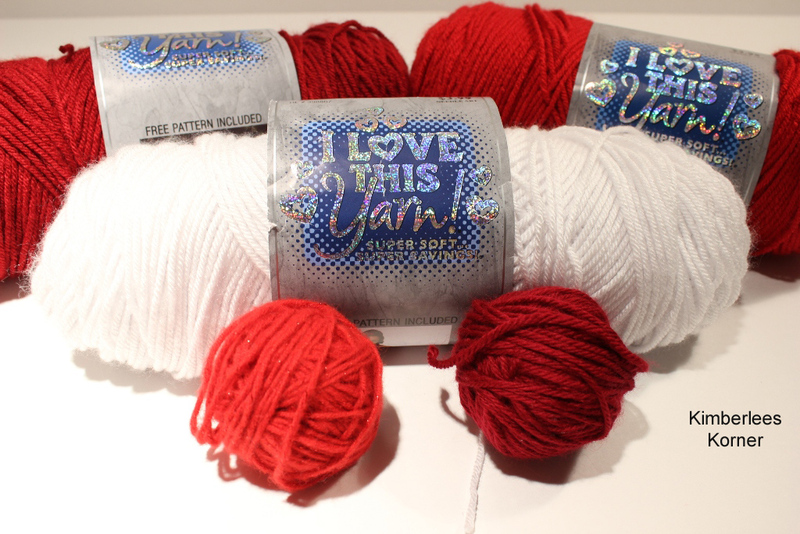 The one was Red Heart Sparkle, which I only used for a couple of stripes in the body of the sweater. I ran low with this one and I didn’t think I had enough for the sleeves so I left that one out of the sleeves. The other yarn was Red Heart Soft in a wine color. Above is a larger, close up view, of the sweater so you can see the stitch. It is mainly stockinette with a ridge in between each color change. 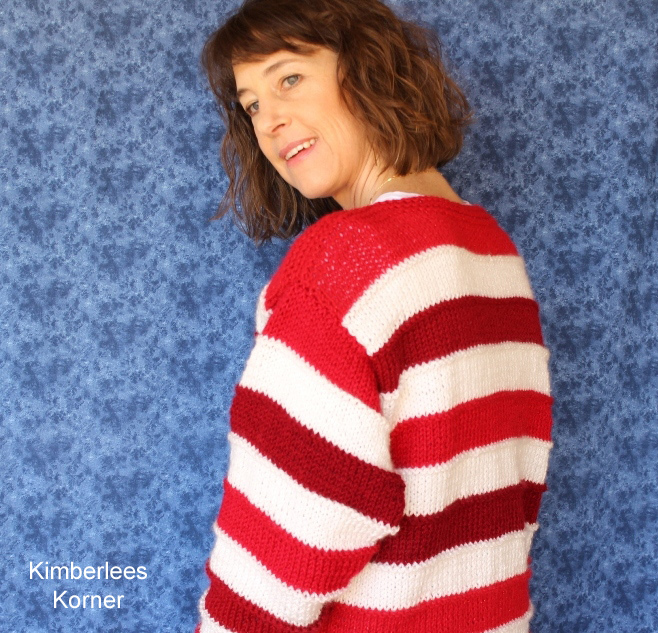 The sweater has garter rows for the sleeve edges and the lower band and at the top neckline and shoulder area. The sleeves I designed to be a 3/4 sleeve. I decided that would be best since sometimes in February we have slightly warmer days and if it does happen to be cooler I can wear a shirt underneath, as in the photos. I kind of like a 3/4 sleeve on sweaters that way they don’t get wet when you wash or hands or do dishes. Overall I am pleased with my new sweater and look forward to knitting another one – maybe in shades of blue with a light gray in place of the white. I am thinking that combination would look good with jeans. 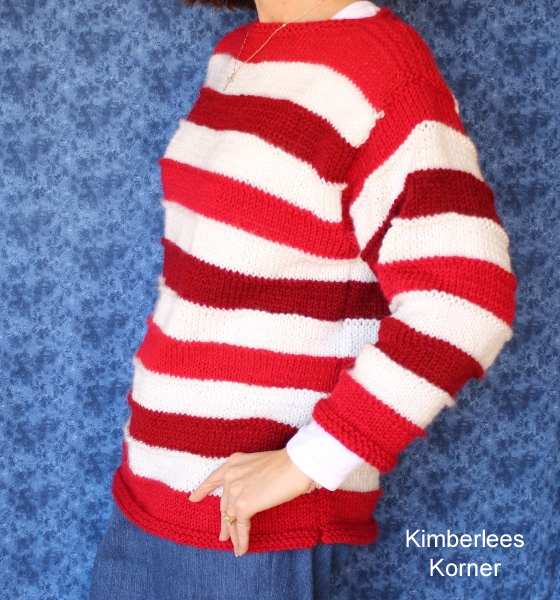 Eventually I will have the pattern for the sweater available in my etsy, craftsy and ravelry shops. What are you currently knitting or crocheting? Let me know by leaving a comment. 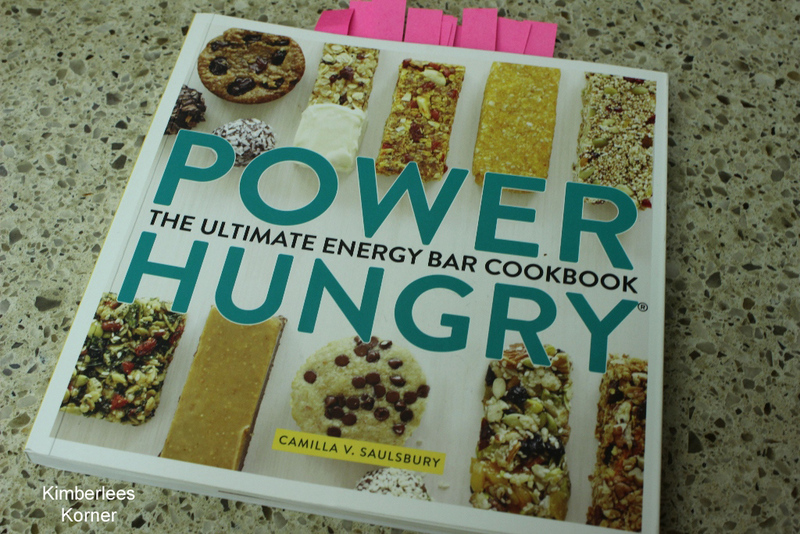 The book Power Hungry by Camilla V. Saulsbury is a collection of recipes to make your own energy bars, granola bars and protein bars. This book is something I came across at Barnes and Noble back in the Spring of 2015. I have been using it on and off to make my own protein and granola bars instead of buying them. Some of the recipes are super simple and you just blend the ingredients together in your food processor and then put into a pan and refrigerate to set them, cut them and you are done. Some of the other require cooking, either some ingredients on the stove top or some actual baking time. For all the recipes in the book there are directions as to how to store them and for how long. There is a room temperature version, refrigerator version and freezer version. The beginning of the book also lists pantry ingredients to have on hand. There are ingredients such as whole grains, natural sweeteners, chocolate and cocoa, canned ingredients, nuts, seeds and nut butters, oils, eggs, dairy and non dairy milks, all natural protein powders and extract flavorings. If you already eat a pretty healthy diet chances are you have a lot of the ingredients already. I found that there were several recipes I could make right away without having to go buy anything. Raisin Bran Bolt Bars – I made the double chocolate version of these and they are kind of like a brownie. My son and his friends came home for lunch from school the other day and they were even eating them – I didn’t tell them they were made with good for you all natural ingredients and high in fiber. Above are a couple of the versions of the bars I have recently made. Mine probably don’t look as pretty as ones you buy in a package but they taste good and that is one of my main goals – to have a healthy homemade tasty power bar. 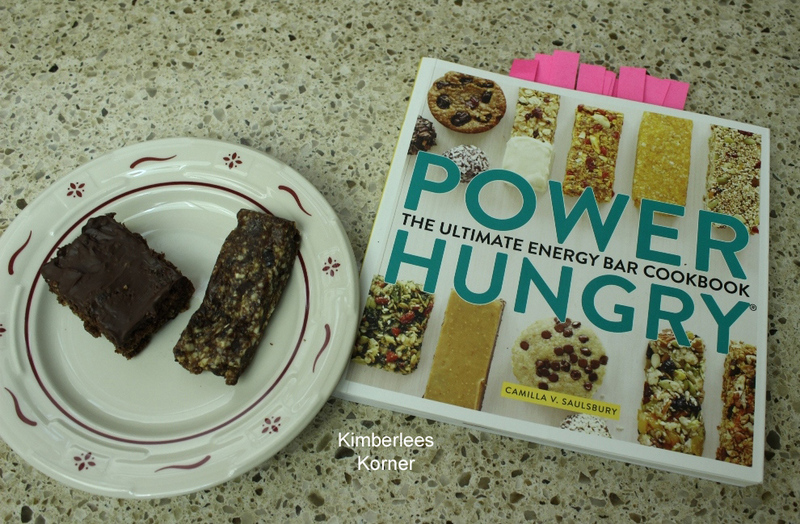 Making your own granola and protein bars is really pretty simple and if you have some great recipes, like the ones in this book, you will always have healthy snacks around. The main reason for making the bars versus buying them for me is that I like to know what is in my food and I want to have control over what I put in them. Also, the cost of making them yourself is a lot less than buying them. Have you ever made your own protein or energy bars? If so, what recipe did you use? Let me know by leaving a reply.